Here is part two of Zoya's Cashmere collection of cremes for Fall 2013! Louise is a chocolate brown creme. Think 75-80% cacao: that's about the depth of brown here. This type of shade will function as a neutral for many people in Autumn. Growing up, I loved brown nail polish for some reason- probably since black looks harsh on my skin- so I'm always excited to try new brown cremes. Next to Pepper, it is much more of a pure brown, and you really do notice that Pepper is very red-toned. Louise dries down slightly darker than bottle color. Also dries to a very glossy finish. Formula: Pigmented, with a medium consistency that leans to the crelly side. The second coat feels thicker since it clings so well to the first. Two coats for opacity. Most of the browns I own are not creme finishes, but here are the ones that are. As you can see Essie- Little Brown Dress is much darker, and can even look blackish in low light. Sally Hansen Complete Salon Manicure- Bittersweet is much tauper than Louise, to my surprise! Next to those two, Louise looks like a straight, basic medium brown. Hunter is aptly named: a hunter green creme. It's a pretty neutral-toned green, maybe leaning to the warm/ yellow side slightly, at least to my eye. I happen to really like green polish, and this is no exception. Formula: Very similar to Louise in every way: crelly-ish, medium viscosity, opaque in two coats, dries very glossy. Self-levels very nicely. I was worried about Hunter being too similar to Zoya- Envy, but Envy is a lot muddier and has more brown or grey in it. Orly- Enchanted Forest and Butter London- British Racing Green both have bluer undertones than Hunter. No dupes here. Flynn is a caramel-khaki creme. Also sort of a camel color. Another good option for a neutral! This has warm undertones, but didn't look terrible on my cool skin, so I think many different people will be able to pull it off. Flynn also kind of fits widely into the "taupe" category as a very, very warm taupe- if you want to think of it that way. It's darker than my skin color, but I think it will look fabulous on darker skin tones where it'll look noticeably lighter! I really loved Flynn, and it's my favorite of these three! Formula: Very similar to Louise & Hunter, crellyish, but a little more sheer. Doesn't self-level quite as well, but very buildable, and opaque in two coats. I didn't have anything like Flynn for comparison, but here are the closest relatives I found in my stash. Orly- Country Club Khaki is much more of a faded khaki and lacks the warm undertones. Barielle- Cashmere Or Lose Me is more taupe, and is also cooler-toned than Flynn. What did you think of this collection of versatile cremes? Here is the first half of the Fall 2013 Cashmere collection by Zoya! This set includes six Autumn-inspired creme finish polishes, and we'll be looking at three today. Sailor is aptly named: a dusty, faded navy creme. This is a darker type of navy that is great for Autumn, and can be paired with many outfits. Sometimes this particular navy hue looked like it contained a good bit of purple to me, but it didn't come through on camera. It does dry a bit darker than bottle color; I wanted to say it never looks black, but actually in super low light, it can. That said, you can mostly always tell it's a navy. Formula: Thick, creamy, and opaque in one coat! As far as cremes go, this is top-notch, but you do have to be careful not to get overzealous and use coats that are too thick, or you'll probably experience bubbling. I...have a penchant [raging addiction to] for navy blues, and I just chose the most similar examples to compare. I did not find an exact dupe for Sailor, as you can see; but in person, China Glaze- Bermuda Breakaway was very difficult to distinguish, to my eye. Sailor is dustier (and maybe purpler? ), as the photo reveals. Pepper is a rusty auburn red creme. There's a lot of brown in this red- I find it very intriguing! Also, the name is really fitting, I think. At two coats, it dries darker and browner than bottle color, which is unfortunate. On the nail, I think most people will consider this a warm, ruddy brown- not a type of red. Formula: Medium-thick consistency which goes on the nail smoothly, but you'll need two coats for opaque coverage. I didn't have anything quite like Pepper! I thought Butter London- Tramp Stamp would be very similar, but it is actually much more of a purpley-taupe type of brown. OPI- Malaga Wine obviously has much less brown in it. Livingston is a medium, warm-to-neutral toned red creme. To me, this is the quintessential red, the most basic red (almost tomato-red) you can imagine, and should be a part of everyone's nail wardrobe. Livingston, unlike the previous two, dries exactly to bottle color, which I really appreciate. I prefer cooler reds, but I think neutral reds like this can be worn by anyone, and I did enjoy wearing this. Formula: The texture leans to the crelly side, but it's buttery and easy to control. Just two coats for nice even coverage, although there is still slight VNL in very bright direct sunlight, as you may notice above. Oddly, I don't have many neutral or warm reds in my collection. Essie- Limited Addiction (also crellyish) is quite a bit darker, and Butter London- Pillar Box Red (creme) is quite a bit brighter. Of these three, I can live without Sailor, but I know some people will dig it. I do enjoy the two reds, and I think all three of these are perfect for Fall. The fact that Livingston's formula is a crellyish (ewww what a word..) gives the finish extra glossiness, which I love. I was disappointed that Sailor and Pepper dried darker than the liquid bottle color. Stay tuned for the other half of Zoya's Fall 2013 Cashmere collection! Inglot Eyeshadow- Freedom Palette #2 [Swatch] ! As requested, here are swatches from the other Inglot eyeshadow palette I created using the Freedom System! These are the first Inglot shadows I fell in love with; I tried to design the palette to include a highlight color, a couple of crease colors, a darker shade I could use as a liner, some all-over lid colors, as well as a couple slightly more colorful tones. I stuck to mostly matte neutrals, as that's what I reach for most, day to day. 344 Matte! Holy mother, I love this one. I use it all over as a wash of color when I'm in a rush, or just in the crease or just on the lid, depending. It's kind of a fawn shade, but you can see there are taupey, purple undertones, and it just flatters blue eyes while still being neutral. It's also very similar to the color "Unconditional" from the Lorac Unzipped palette, but they're not dupes. The Lorac shadow is warmer, with more red undertones. I'm just starting to fully appreciate this one: 446 Pearl. Sometimes I use it in the outer-V, or as a liner color, but it's got a really interesting duochromey thing going on in the sun. Not an everyday shade, but fun. These (top) three are my go-to brown matte neutrals when I want an easy, three-tone neutral eye (most days!). 337 goes all over the lid, 360 goes lightly into the crease for daytime, and I use 326 as a liner color on the top lashline or blended in the crease for night time. Swatch time! These are shown over naked skin with no primer. I find photographing your own arm truly difficult, so I apologize if everything not being in focus at once is bothersome. You can see how rich the mattes are, and how shiny and light-catching the pearl finishes are, without being glittery at all. Both textures blend very easily, and really spoil me when I go to use other brands of eyeshadow. 11 Shine is probably my least favorite here. It's too yellow-toned, but I'm being picky. 451 tends to look much bluer on skin than it does in the pan. See the duochromey-ness in 446 pearl? In the sun, they look like jewel tones + neutrals, which I guess is what they are. Now I will say, that since my initial Inglot eyeshadow & Freedom System post, I have rearranged my shadows between the two 10-pan palettes I have. I loved the way I'd designed them at first, and thought they were really pretty combinations, but working with them was less practical that way. They are definitely not as aesthetically pleasing this way, but they're more functional for my purposes. And, I do tend to gravitate to the top, warmer palette 95% of the time! That's the beauty of the Freedom System! 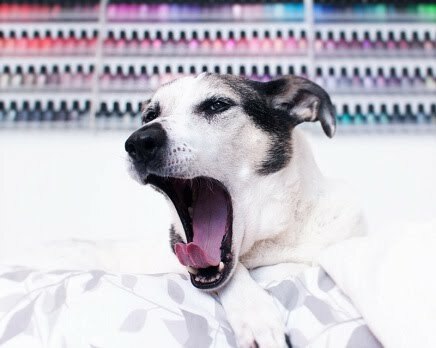 Jamberry Nail Wraps [Giveaway] Winner! Mail-time: Zoya Liberty Promo Order! Recent Accent Nails, Edition #4!